News :: Middle Distance Runner on Flash Forward! ABC’s Flash Forward will be playing MDR’s song “Brother John” on tonight’s episode! Tune in to watch at 8pm EST. Also their song “Man Of The People” has been heard during a bunch of games for March Madness this month. Right now the guys have a few more shows left on this tour, which included 7 shows at SXSW this year. And yet to come is a Daytrotter session that they’ll be recording on Saturday! Enjoy this live footage taken at SXSW by Eric from The WILD Honey Pie. Thanks for filming them Eric, turned out great. 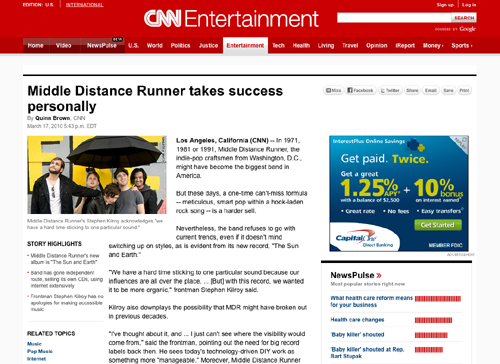 News :: MDR on CNN! CNN recently interviewed Middle Distance Runner’s frontman, Stephen Kilroy, which appeared on the front page of the Entertainment section last week! Read the full article here. News :: MDR on Tour and SXSW dates announced! Heading down to Austin this week? Stop by one of many shows that Middle Distance Runner will be playing at this year. And if the great tunes isn’t enough well there will be free pancakes at the Moose Lodge and free Lonestar Beer and food at Between The Music on Lamar street. For the unlucky folks out there who can’t be enjoying the warm Texas sun with us then check out the tour dates below and perhaps MDR is coming to a town near you. Erik from MDR made the tour poster below, ha, I think it’s great. Well not really, but this promo video for their show at Iota tomorrow night in DC where they play a bunch of different singles looking for action is pretty hilarious. Check it out below!